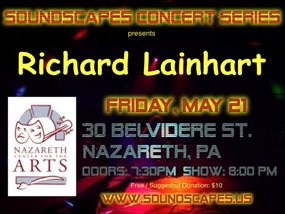 Soundscapes Concert Series presents Richard Lainhart :: May 21, 2010; 8:00 – 10:00 pm :: Nazareth Center for the Arts, 30 Belvidere Street, Nazareth, PA. The Soundscapes Concert Series is the concert companion to the Galactic Travels radio program on WDIY and presents electronic music to the Lehigh Valley. 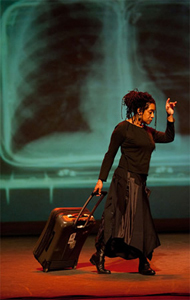 This is the concert series that presented Robert Rich (California), vidnaObmana (Belgium), The Ministry of Inside Things (Philadelphia), and Orbital Decay (Quakertown), Technicolor Travel Agency (Poconos), and Twyndyllyngs (Lehigh Valley) to local audiences. 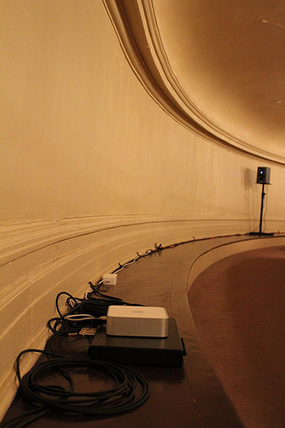 SOUNDSCAPE 2010.1 :: May 20, 2010; 6:00 – 10:00 pm :: Marriot Hotel, 275 Tremont Street, Boston, MA. 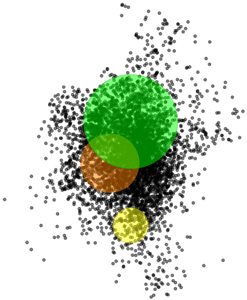 14 Musicians (red dots) play in 2 clubs simultaneously. 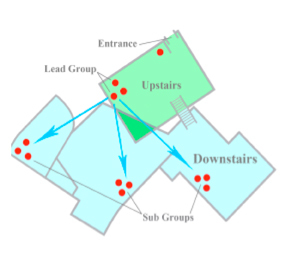 A lead group will perform upstairs (green area). 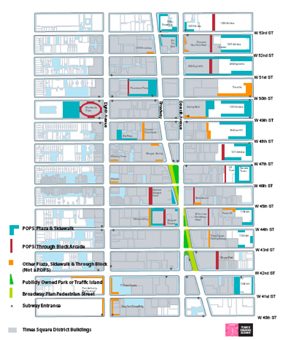 Their sound will be transmitted downstairs (blue area), and played on speakers throughout the space. 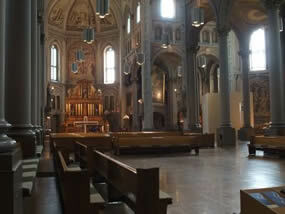 Musicians downstairs will play in synchronization with the lead group’s sound. We are stretching an orchestra out, so you become your own composer/conductor, shaping your musical experience by moving through the space. 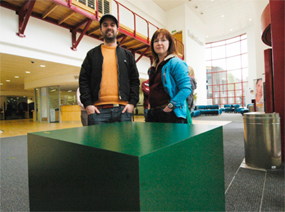 Vibe Cube by Damien Robinson and Stuart Bowditch :: July 2010 :: CoExist Gallery at TAP, North Road, in Southend.